I've got Frankenstein on the brain. 2018 is the 200th anniversary of the publication of the classic science fiction novel Frankenstein and Indiana Humanities is celebrating with a One State / One Story program, encouraging communities all over the state to read and talk about this book. My library was one of the lucky ones to receive a grant to provide programming, so we definitely have all things Frankenstein on our radar. 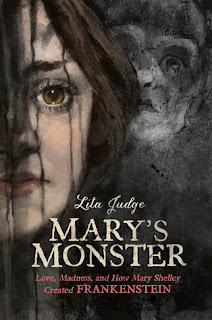 Mary's Monster: Love, Madness, and How Mary Shelley Created Frankenstein by Lita Judge is a biography in verse that tells the story of Mary Shelley. AND HER LIFE WAS DRAMATIC AS HELL!!! Seriously. Drama. Her mom died when she was a baby, something Mary always blamed herself for a little bit. She got sent away to Scotland by a stepmother who didn't like her. She fell in love with a married man (who wasn't that much older than her - Mary was 16 and Percy was 21), left her family to be with him and then he started fooling around with her sister. She had a baby with the married man and the baby died. And that's just like the first part of the book. In Mary's Monster, this is all told in carefully crafted prose poems that are paired with dark, brooding artwork that really brings the time period and the intensity to life. The text and artwork in this book are equally impressive to me. The texture of the art really conveys a lot of emotion - dark and smokey backgrounds lend a sense of mystery and foreboding. At times it looks like ink has spilled across the pages, appropriate for a biography of a writer. and the color of coal. This is a powerhouse of a book that will give teen readers a new perspective on Mary Shelley's life. You don't have to have read Frankenstein to get swept up in the drama, but this would make a super supplementary title for students who are reading it. You really see where the creature's longing to be loved and to have a place where he belongs comes from: Mary was searching for the same thing. The back matter is a joy. Lita Judge includes end notes that flesh out the story of Mary's life and finish the stories of characters we meet in the book. She explains events she left out and why, and there are extensive source notes. Hand this to teens with dark and gothic souls who will be swept up by the tragic romantic story of Mary Shelley's teen years, teens who are writers, and teens who love to read about All the Drama. Fans of dark graphic novels like the newly illustrated Speak: The Graphic Novel by Laurie Halse Anderson, illustrated by Emily Carroll will dig this verse/graphic hybrid. Readers who enjoy biographies in verse like Your Own, Sylvia by Stephanie Hemphill (Random House, 2007) or Borrowed Names by Jeannine Atkins (Henry Holt, 2010) may also like this one. And readers who like intense, dramatic books about historical figures like The Borden Murders by Sarah Miller (Schwartz & Wade, 2016) or Terrible Typhoid Mary by Susan Campbell Bartoletti (Houghton Mifflin, 2015) may also be fans. Mary's Monster: Love, Madness, and How Mary Shelley Created Frankenstein by Lita Judge. Grades 8 and up, adult crossover. Roaring Brook, February 2018. 312 pages. Review copy provided by my local library.